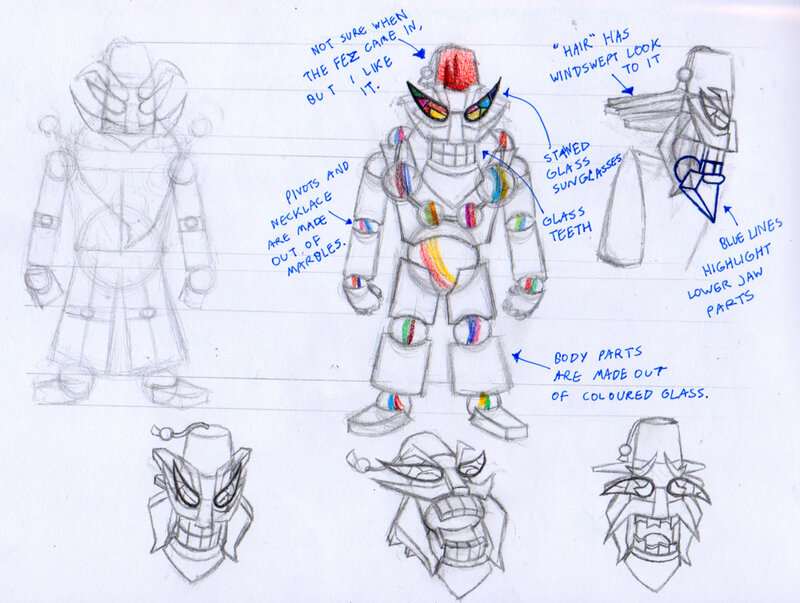 But seriously, designing a villainous character out of glass was an interesting challenge for me. I had no frame of reference and no objects besides windows that use glass that the villain could be based on. I certainly couldn’t make a window with legs! So I had to get really creative with how the character should look. First off, it became clear to me that I wanted him to have a beard. No special reason; I thought a sharp and pointy beard would make his villainous personality all the more evident. And since glass is usually coloured in light blue, I decided to make the character seem rather old (don’t ask me how he ages, that’s uh… not important). So with those two ideas in mind, I began experimenting with shapes. 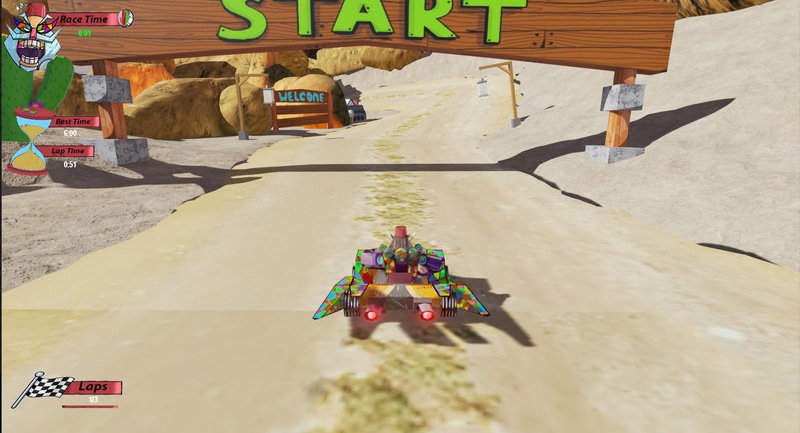 I eventually came to the decision of giving him marbles in the body pivots, which is not only an interesting design choice, but also makes him look more colourful. I wanted him to look imposing in some way, so he was designed to be rather tall. And lastly, he had to look flexible. 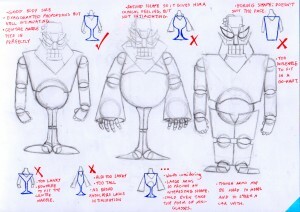 He had to look like he could actually move, which for a character made of glass, seemed like a big obstacle at first. But the marble pivot idea made it a lot easier. I wanted him to have a nice big evil grin… with glass teeth, so a big smile was clear to me. And I wanted him to have glasses, which was the only object that felt right for the material of the character. I made them stained glass to suit the style of his car. For some reason I can’t remember, I gave him a fez hat made of glass as well. I don’t remember why. I guess his bearded face reminded me of Indians for some reason, so I gave him a fez and stuck with it. It at least made him look dignified. Even though since he’s made of glass and is almost entirely opaque, I wanted his body to be coloured glass of course, so I went with purple colours for it is often the first colour people think of when they think of evil. 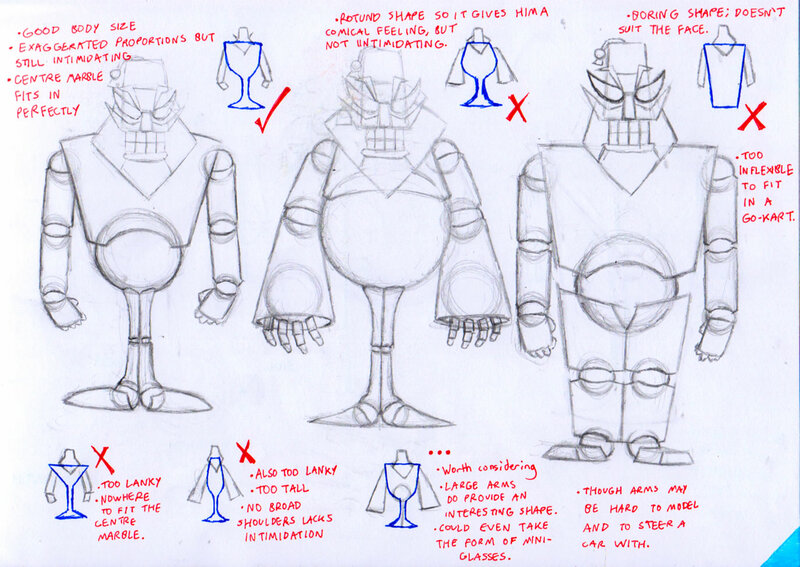 And lastly, I decided to make his body shape in the design of wine glasses, which was a pretty cool idea. In the end I gave him a roughly boxy torso accompanied by huge drinking glass-like arms and spindly legs. All of this wrapped together formed one of the most bizarre yet coolest characters I have made yet. 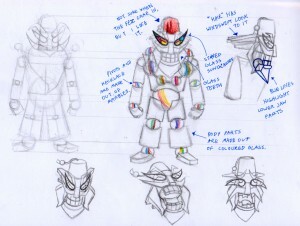 The programmers like the design so much that in the time they had to make the game, they chose him to make the first 3D model out of. Unfortunately, he was the only 3D model they could make in the time of making the game, which made the idea of racing in the game seem very lacking seeing as how there were no other characters to race against. But still, they did a good job modelling the character. I couldn’t even imagine how this guy would look when he moves, but then again, he doesn’t move much apart from sitting in his car, so there was that little problem solved. 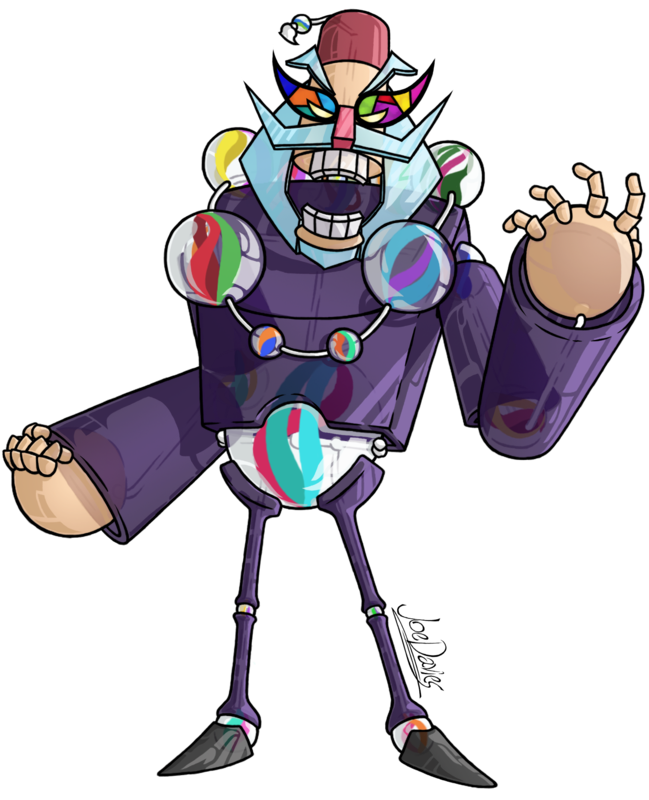 Personality-wise, I of course made him as villainous as it gets, but I made the idea that because he’s made of glass, he makes no effort to hide it. If anything, he embraces it. He loves cheating and picking on others when he wins against them. This could have made victories against him more cathartic for the player. Lastly, his name. He is old-aged, so I thought of the word “elder”, combined with a classic terminology of glass being “shard”, mix them together and you get “Elshard”. Honestly, I would have wanted to see Dougie modelled in the game instead of Elshard, but I can see why my colleagues liked him. He’s weird, but strangely cool at the same time. I kinda like him.